I am a sucker for a great handbag and the ones we just received from Rebecca Minkoff are on-point. The hardware, the leather, and the beautiful colors make Minkoff’s bags extremely coveted. Minkoff’s designs are a dose of uptown elegance with a dash of downtown edge. The Mini MAC just came in, in perfect patent. Classic enough for date night and versatile enough for every day. This is your forever bag. There is also a Mini MAC in Baby Blue aka Carolina Blue–the perfect gift for any Carolina woman. 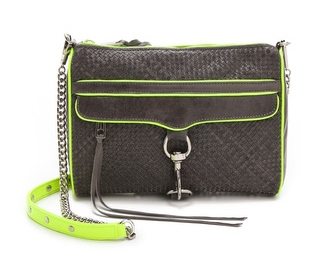 Every location carries Rebecca Minkoff so there’s no excuse for not being a Minkette. But you better move quickly; these bags don’t stick around for long!